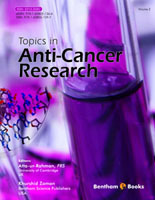 This is the second volume of our Patent eBook Series entitled "Topics in Anti-Cancer Research". The eBook includes updated chapters on important topics of cancer published in the Recent Patents on Anti-Cancer Drug Discovery. The volume covers scientific and patented novel chemotherapeutic agents and drugs for metastatic castration-resistant prostate cancer and Ras/ Raf /MEK/ERK pathway, P1K, AKT and mTORC1/2 inhibitors, ATPase inhibitors for cancer therapy, and sphingomyelin biosynthesis which regulates cancer cell death and growth. Tanaka et al., present the latest literature research and strategies on therapeutic agents and patented compounds and improvement of survival for metastatic castration - resistant prostate cancer (CRPC). The role of novel patented compounds e.g. N-cadherin, AR splicing variants, PCGEM-1, ELR-CXC chemokine antagonist, dual inhibitor of MET and VEGF as an alternative options for prostate cancer has been discussed in Chapter 1. Chapter 2 by Ségui et al., focuses on the regulation of cancer cell death, sensitivity and growth by sphingomyelin biosynthesis through a series of metabolic pathways and sphingolipid signaling. Hematological malignancies are also discussed in this chapter. Chapter 3 provides a complete overview of novel patented compounds and patent applications inhibiting the activities of B-Raf/Ras/ERK and MEK signaling pathways. Wong et al. present the results of current clinical trials of these inhibitors. Tabernero et al., in Chapter 4 review new emerging preclinical researches, clinical trials for targeting of P13K, AKT, dual P13K and mTOR inhibitors for treating different types of cancers. Approaches for studying main stages of cell cycle via biochemical regulatory processes and energy metabolism in cancer cells are presented by Rumjanek et al., in Chapter 5. These pathways are inhibited by synthetic and natural compounds and the involvement of cyclin dependent kinases and phosphatases, oncogenes, mitochondria and histone deacetylases is also discussed. Hernández et al., in Chapter 6 have given an overview of the origin, structure, function and mechanism of action of patented V-ATPase inhibitors by intraorganellar acidification of membranes for the treatment of cancer. Chapter 7 describes the use of monoclonal antibodies (MoAbs) used in cancer therapy. Napolioni et al. discuss the mechanisms, genetic profiles and interaction of the Fc gamma receptors (FcγRs) with immunotherapeutic drugs. Sharma et al., present the key role of molecular vascular endothelial growth factor (VEGF) in the treatment of metastatic renal cell carcinoma (RCC) with reference to patents for anti-VEGF drugs for RCC and molecular pathways involved in the development of angiogenesis drugs for renal cancer in Chapter 8. In the next chapter, Boel De Paepe covers different approaches on tumor neovascularization as a target for cancer therapy. Novel anti-angiogenic agents are also discussed along with relevant biological pathways of neo angiogenesis and its inhibition by natural metabolites, pharmaceutical compounds, and combination therapy. Cerqueira et al. in Chapter 11 review the papers and patents on RNA inhibition, ribonucleotidase reductase inhibitors structure, action mechanism and biochemistry. Rribonucleotidase reductase is clinically used for the control of different specific types of cancers. Karpel-Massler et al. focus on relevant patents for enhancing the anti-cancer activity of erlotinib by combining HER/EGFR- targeted TK inhibitors for the cure of malignant glioblastoma in Chapter 12. Imran et al. present the role of nanodrugs in cancer chemotherapy. Nanodrugs act specifically on cancer cells. Nanodrugs diversity and mechanism, future perspectives, and conventional chemotherapeutic drugs are discussed in Chapter 13. Chapter 14 by Hsieh et al. describe the present status including the literature and patents on nano-sized camptothecin and its analogs for cancer chemotherapy. In the subsequent chapter, Soria et al. discuss the patents on recent developments of redox - chemoprevention by dietary onconutrition and the role and assessment of anticancer functional biomarkers and biomolecules. Topics in Anti-Cancer Research, is an essential e-book series for oncologists, pharmaceutical scientists, clinicians, scientists, R&D experts and researchers in other cancer related disciplines. It is hoped that the second volume will be of immense interest to a large number of medicinal chemists, pharmacologists, researchers, clinicians, scientists, R&D experts and medical doctors seeking new targets for the prevention of cancer and new developments for cancer chemotherapy. The editors wish to express their sincere gratitude to Mr. Mahmood Alam, Ms. Raheela Anjum, Ms. Iffat Shaheen and Mrs. Rafia Rehan, the reviewers, the authors, friends and all colleagues for their assistance in the finalization of eBook.